It’s been so hot the last few weeks that the last thing I want to do is turn the hair dryer on but I was so curious about THERMAFUSE’s new Heatsmart Serum Dry Oil Treatment ($19/2oz @ amazon.com for a salon near you) I just had to. It's a blend of three proven good-for-hair organic oils – Argan, Acai and Flaxseed. Who is this one made for? Those who need a little hair repair and for those with frizzies, which seems to be all of us. Apply it to dry hair as a hair finisher or as I like to, right before blow drying. The heat really helps the oils do their work and beautifully. And if you are like me and love the smell of products, they infused it with a vanilla musk scent. CHARLES WORTHINGTON Hair Healer Leave-In Conditioner ($5.99/6.75oz @ target.com) for when I know I’ve stressed my strands out and they need some extra TLC. THERMAFUSE Fixxe Volume Moussse ($13/7.5oz @ thermafuse.com) for I know that big hair is in this fall and I just have to partake in the trend. AUSSIE Opposites Attract Strong Hold + Touchable Feel Spray Gel, Strong Hold ($3.99/6.8oz @ walgreens.com) for when I’m wearing my hair wavy or curlier than usual and want it to stay in past 11am. And no crunch! We're in the home stretch of summer, all the way to the tips of our strands! THERMAFUSE has created a special kit for those of us who insist on torturing their hair this time of year. 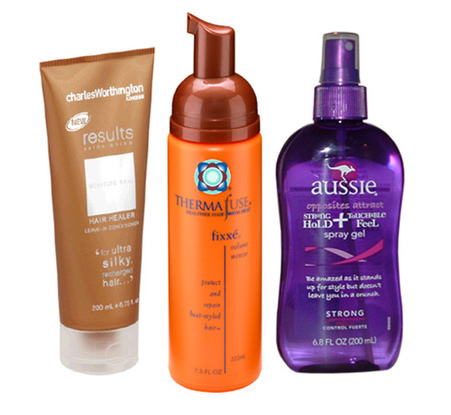 Their Summer Essentials trio is all the necessary strand savers: the spray-on ThermaCare Leave-In Conditioner ($18.50/8oz), Esculpt Medium-firm Gel ($16.50/6.8oz) and the frizz-eliminating spray, Shine Polishing Spray ($14/2oz). And if the damage is already done, check into their Summer After-Care Treatment trio. You can thank us later. All @ thermafuse.com.